Megan Shoemaker, who works in Jewelers Row in Center City, holds the engagement ring and wedding band she designed and cast in 14K white gold. She gets married in May to her fiance, Jason Rivkin. Sometimes you can tell when a love story isn’t going to work out. For Philadelphia jewelry designer Megan Shoemaker, it was when the customers for an engagement ring she was designing sent back the drawings several times for changes. Other times, thankfully the majority of the time, Shoemaker, who has been designing engagement and wedding rings for a manufacturer in the city's fabled Jewelers Row and through her own company, finds herself part of love stories that are inspiring and heart-warming. Valentine’s Day is the last popular day of the engagement season. According to surveys from Facebook and other social media sites and wedding experts, the most popular dates to pop the question are Christmas Eve, Christmas Day, New Year’s Eve, New Year’s Day and Valentine’s Day. 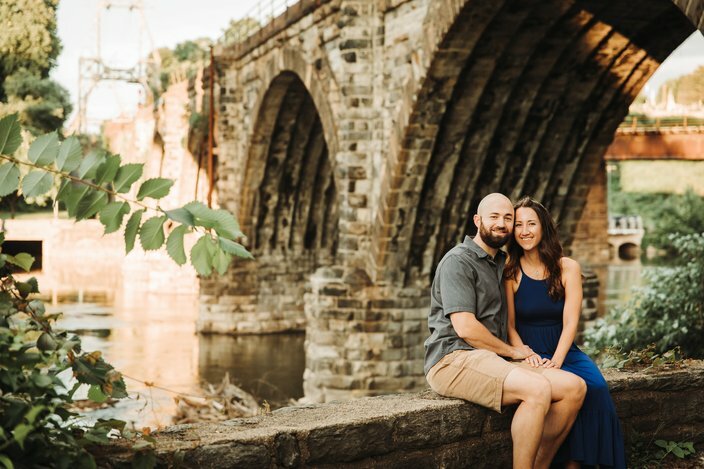 Megan Shoemaker and Jason Rivkin will be married in May. Rivkin proposed last year, shortly before they were going out for their belated Valentine’s Day dinner. She will design his wedding band as well. 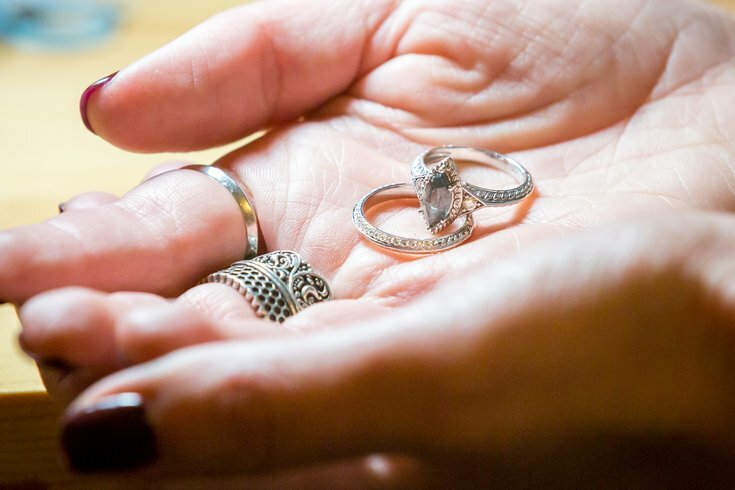 That was certainly the case for Shoemaker, 30, who is now busy designing her own wedding rings after spending three years designing rings for others through her company, Mosette Jewelry Design. Her fiancé, Jason Rivkin, proposed last year shortly before they were going out for a belated Valentine’s Day dinner. While Rivkin got an engagement ring, he was wise enough to know Shoemaker would want to design her own, so the stone, a salt and pepper Marquise, was set in a simple, placeholder ring. For her official engagement ring, she is adding diamonds from a pendant that belonged to her mother, and while she is still in the process of designing her own wedding bands, she knows she will be adding their wedding date in May to the inside of the white gold bands. “Jason wanted something simple, but I’m a designer so I wanted to jazz it up a little,” she said. Few decisions are guaranteed to cause men more anguish than selecting the perfect engagement ring and going the custom design route can be particularly challenging. So Shoemaker offered several pieces of practical advice: first off, know the ring size. For her official engagement ring, Shoemaker is adding diamonds from a pendant that belonged to her mother. Then comes the bigger decision, what diamond shape: round, oval, pear, cushion, princess? It normally takes between three to five weeks for a ring to be designed, typically on a computer, the design set in a mold using a 3-D printer, plus casting, cleaning, polishing and setting the stone. 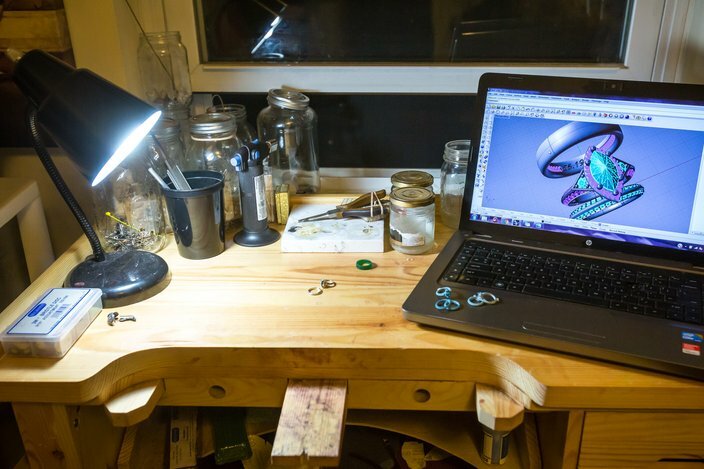 Jeweler Megan Shoemaker's home workbench and computer showing the 3-D computer-aided design image of the engagement ring and wedding bands she designed. While diamonds remain the most popular gemstone for engagement rings, Shoemaker sees other requests. “I've been creating alot of alternative engagement rings using black pearls, colored gemstones, or black diamonds,” she says. She wouldn’t be surprised if Philadelphia’s biggest love affair right now wouldn’t inspire a custom engagement ring design soon. If they do, Shoemaker, a graduate of the Tyler School of Art at Temple University, is ready.